Ceylon's Wand-erland is the creation of Chasity Rader of Ceylon Persians. Chasity has been showing, breeding and raising Persian cats since 1998. Her cats can be found in pedigrees throughout America and generally, worldwide, and most of her lines are overseas. Ceylon Persian cats have achieved titles from Champion to Grand Champion while making CFA history several times with 1st-time color/titles and other color achievements never accomplished before. Chasity purchased cat teaser wands and toys from all over the world which got her creative mind to start imagining a better cat toy. Designing and making unique cat toys for all pet lovers is a passion for Chasity Rader. Chasity says "Anything that glitters and shines catches my eye. 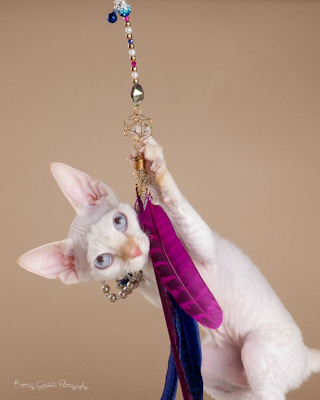 I love creating my cat teaser toys with genuine crystals, fancy feathers, and quality glitters!" Pelaqita Persians has several of Ceylons Wand-erland cat teaser wands and uses them frequently to play with her cats both at home and at the show hall. I heartily endorse these products!! When did you start Ceylons Wand-erland? I first started designing my wands as gifts for my friends in February of 2015. I was tired of always wanting something that only existed in my imagination and sought just to create it. What made you start designing cat toys? I started this venture because I have always enjoyed buying cat toys and playing with my cats. I bought teaser toys all over the world and still cherish them all. It always breaks my heart to have to throw one away if it gets ruined. I do take a great deal of pride in the fact that Ceylons Wand-erland designs are unique. Unfortunately, because my designs are so creative and pretty, this has created a market for opportunistic copycats who are now designing less expensive and less durable knockoffs. I try not to fuss over the copycats out there; rather I choose to believe that those copycat designers creating cat teaser toys are doing it for the same reason I am. They are men and women sitting at home investing a lot of time and money into creating their vision just as I do. I have had ideas in my mind for years about how I'd create a cat teaser toy if only it existed out there somewhere! And yet no one ever created the visions that I had in my imagination. So, one day I set out to create my ideas and make them as gifts to a few select friends. As you know, start-up costs can be expensive, and I spent over $1,000 just for supplies to make the initial wands that I gifted to my friends. At that point, I realized I should see if people other than my friends would be interested in buying my cat teaser toys. At first, I was working part-time as a Bartender and wanted to leave the industry, but without having another job lined up, I was leery of taking that leap of faith. It wasn't long before I decided I was ready to sink or swim and I left my job and started working from home full-time on my creations! I have gained more ground in the first year since working on Ceylon's Wand-erland full-time, than my five-year business plan allotted for, and I so appreciate the support of my customers that allowed me to achieve this. I work hard to make sure every customer and cat are happy. I offer free wand repairs to help ensure nothing is ever wasted. It is rare that I have to repair any Ceylon's Wand-erland cat teaser toys, but accidents do happen. I am proud to say that I have repeat customers not because their wands have been torn up and thrown away, as their wands are still beautiful and going strong even after a year of heavy use, they just want another wand! As the designer of Ceylons Wand-erland products, what do you believe is your best asset? My imagination I think is my best asset. I never run out of ideas. I'm always sketching new styles, and I have even more amazing things I want to create such as my own comb line. My ideas are truly one of a kind, and I've basically redesigned the comb and how it functions. It's just a matter of time before everything is properly filed and we have a manufacturer who can take on this challenge. Why choose Etsy rather than perhaps, Amazon, to market your cat toys? I've thought about joining Amazon. It's still not out of the possibility that I may move my shop there in time. However, I love the artsy entrepreneurial spirit Etsy brings to the market. The style, spirit, and opportunities were already there where I felt my line fit. It's been a good match for the start of my business. However, I'm expanding far beyond Etsy. I now have sales reps in Malaysia, Australia, and Denmark. Does your experience as a Persian cat breeder aid you in the types of products you design? Yes, I believe it does, but I've learned the hard way that my Persians cat toy needs are not the greater needs of cats overall. My Persians tend to paw at their toys and are overall pretty gentle compared to what a robust Oriental or a Bengal can do to a teaser toy. That's been a big learning curve for me to conquer. I've learned more about millinery work than I could have ever dreamed of. I can identify feathers from specific birds and parts of their bodies the feathers come from and what type of feathers suit a specific breeds needs. There are more cats out there than Persians, and their playful nature and strength varies greatly. Oh, this is just going to sound goofy to say out loud. I'm sorry, but this is 100% true. It's my customers! Both human and feline that's always inspiring me. I get the most amazing emails and private messages with videos and photos. After the sheer appreciation for these blessings passes a bit, I see more than before through the photos and videos. I often see new ideas from my customers. For example, an Ocicat that needed a longer handle than the design they were currently playing with. Or a more flexible topper. Perhaps an auditory need. Sometimes a bell isn't enough to attract a cat, so I work on other materials and stimulations. Where or how do you come up with new ideas for new products? The successful final result is my favorite part of any wand design. I love getting to lean my chair back and just relax after finally accomplishing a successful idea. The failures behind each successful wand are the part people don't see. The purchasing new products to test for use on a new design is a nightmare. The testing and failing are time consuming and expensive. Not ever letting me forget how stressful that part of the process is as well! I do not want to be wasteful. That just drives me up the wall. So I hold onto everything that's failed, and I never stop thinking about them, and I create new ways to make those parts, individually if not collectively, work in another way. How do you evaluate a successful design? When designing my wands, I think about practicality, function, and safety for the cats, and then I add my touch of glam! I always put the cats first in my designs, and I often ship wands out to 'product testers'. They are the silent participants behind the scenes that help to make my designs successful. I would not be where I am today without them! What types of materials do you use in each of your designs? I use safe resources for my feather supplies, so I can live with a guilt-free conscience knowing my feathers come from cruelty-free suppliers. I do my best to avoid commercially purchased feathers because I do not know their source (and they will not disclose that information). My boas are commercially purchased, and I am working on getting an exclusive contract with a boa manufacturer in the future to ensure all of my feather sources provide peace of mind. Naturally, I use genuine crystal beads. Everything from the different glues I use to the different glitters has all gone through many, many tests to reach the final results. Are your designs more expensive than other products currently on the market, and why? My designs do cost more than others out there, but I believe in the quality being equal to their cost. I pay extra for components to ensure top-quality, and I do everything within my power to keep my prices as low as possible for my happy customers. I have created, as mentioned earlier, a new less expensive wand design for the Cat Cafe. It's a tricky fine line in using the less expensive material to offer a less expensive design to a customer without losing the overall quality, recognition, branding that Wand-erland is known for. I do work very hard to offer lower prices to help accommodate everyone's needs and wants. What is your favorite wand that you designed, and why? My favorite wand is my Classic Snow Wand. For me, it offers the style, luxuriousness, flair and grace with the right amount of bling in a sturdy classic wand. I worked for months creating my own unique recipe so the glitter flows properly in the handle and I think it shows. Tell us about the Ceylons Wand-erland Australia, what prompted this? This is a sort of six degrees of separation of Wand-erland. It's a fun project I feel very blessed to share. I have been working with the most incredibly talented woman, Adilah Roose, in Malaysia for quite some time now. She's the Sales Rep that covers Thailand, Malaysia, Indonesia and Singapore for Ceylons Wand-erland. Aside from our business together of our beloved cat toys, she's become a part of my life I can't do without. Adilah runs her own successful Rosette business and Box making business and Jacqui Bennett, a CFA Judge, who always has at least one Wand-erland toy in her Judging arsenal, introduced Adilah to my line. One thing led to another and Adilah felt the connection to my dedication and hard work bound in my product line that she wanted to join in! From there, my business was simultaneously growing overseas with a particular interest from Australia. Adilah introduced a friend of hers to my line, and Amanda Herde became a regular customer of mine. Before long she had grown quite the collection of my designs she too became curious about helping spread the love and joy that she has with her cats playing with the Wand-erland teaser toys. She told me this funny story of her cats breaking into her closet where she stored all of her wands one day when she wasn't home. They dragged out every cat toy she had safely put away. Sadly many of them were destroyed except the Wand-erland toys. They had taken just as much rough play and abuse as the others, but they survived the assault. LOL Amanda was a die-hard, dedicated Wand-erland customer like many others out there who felt Australia's cat toy market was severely lacking. She has been introducing other breeders to my line at cat shows, and a friend of hers (Julie Lawrence) become hooked as well. These lovely ladies decided to join the Wand-erland Family, and that's how Wand-erland Australia happened! Together these two ladies have pooled their talents, and I am enjoying working with them. As of today (August 1, 2016), I'm proud to introduce another Wand-erland Family Member, Mette Lambert, in Denmark has just become my newest Sales Rep! More information will become available in the up-and-coming weeks. Click here to visit Mette's Facebook page. The Dodo Bird Wand is a flittery fluttery wand featuring Swarovski crystals with a Feather top. The feathers selected in this cat teaser toy flitters and flys creating both a visual and auditory stimulation to bring out your cats natural instincts to play. The feathers are able to withstand some chewing as your cat pounces to catch it's prey. Click here to purchase the DoDo Bird Wand. Elevate your cats play with one of Ceylon Wand-erlands' custom cat teaser cat toys. 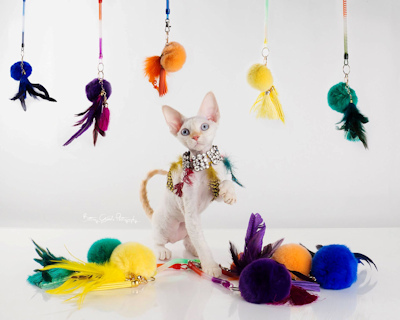 Our March Hare Cat Toys are an interactive cat toy that feature only the highest quality components to make these catnip toys, hanging cat toys, cat feather toys a functional works of art. This is a cat toy meant to hang inside a show cage/tent or to hang at home for fun playtime for your pampered felines. Click here to purchase the March Hare Cat Toy. This Is the Nebula Wand. 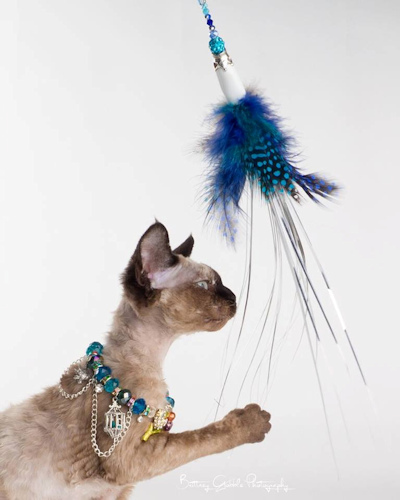 It's a full length cat teaser toy and features a thin Mylar tinsel top that flips and twinkles as light bounces of it's sheen and it's a wand featuring Swarovski crystals with a Feather top. The Mylar tinsel can be trimmed down to desired length. This wand creates a colorful visual stimulation to bring out your cats natural instincts to play. The feathers are able to withstand some chewing as your cat pounces to catch it's prey. In addition to the beautiful top, the handle is carefully hand crafted individually no two are ever alike. Each Nebula wand handle is created to give a glimpse of an outer space nebula or an undersea adventure. Everyone is beautifully unique and looks like a world of it's own. 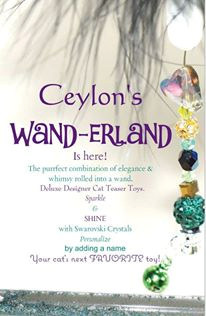 Elevate your cats play with one of Ceylon Wanderlands custom cat teaser cat wands. Our Flutterby Cat Wands are an interactive cat toy that feature only the highest quality components to make these catnip toys, cat feather toys functional works of art. Just a flip and flutter, a truly delightful tease. Pose-able and Fluttering Winged Butterflies with a dainty glitter color fluid filled handle and as always only the best Swarovski, Swarovski Elements and other fine Austrian Crystals. Click here to order your Flutterby Cat Wand. Visit Ceylons Wand-erland website for more information on products. Visit Ceylons Wand-erland Etsy page to look at all the great toys, wands, and teasers that Chasity has created. Visit Ceylons Wand-erland's Facebook page. Chasity runs many promotions throughout the year with great discounts. Her Facebook page is a fantastic way to keep up on any current promotions. Ceylons Wand-erland Malaysia, Indonesia (Asia). Contact Adilah Roose via her Facebook page. Donna can often be found in the USA with the Ceylon's Wand-erland Vending booth at cat shows along with her Posh Pet Accessories line.